Who do I choose for an Executor or Trustee? I’ve recently written about the difference between a Will and a Trust. But, I’d like to discuss fiduciaries. While the term fiduciary is a legal term with a rich history, it very generally means someone who is legally obligated to act in another person’s best interests. Trustees, executors, and agents are all examples of fiduciaries. When you pick trustees, executors, and agents in your estate plan, you’re picking one or more people to make decisions in your and your beneficiaries’ best interests and in accordance with the instructions you leave. Luckily, understanding the basics of what each of these terms means and what to consider when making your choices can make your estate plan work far better. A revocable living trust is often the center of a well-designed estate plan because it is simply the best strategy for achieving most individuals’ goals. In many revocable living trusts, you will serve as the initial trustee and will continue to manage the trust assets as you had in the past. Your successor trustee will be responsible for making sure your wealth is passed on and managed in accordance with your wishes after your death or during your incapacity. Like each of the following individuals involved in your estate planning, it’s best to have a trusted person or financial institution carry out this vitally important role. Financial powers of attorney grant individuals the ability to take financial actions on your behalf such as purchasing life insurance or withdrawing money from your accounts to cover your expenses. A person who acts under the authority given in a power of attorney is generally called an agent. Regarding financial decisions, an institution like a trust company, can also be named. Keep in mind that trust companies will charge a fee for this service. Advance Directives for Health Care cover a wide range of specific actions that can be taken regarding an individual’s medical needs such as making decisions about the types of care you receive or who will be providing the care. Your executor is the person who will see your assets through probate, if necessary, and carry out your wishes based on your last will and testament. Depending on your preferences, this may be the same person or institution as your trustee. You might also see this position designated as personal representative, but it means the same thing. Some individuals choose to go with a paid executor. This is usually someone who doesn’t stand to gain anything from your will, and is often the best choice if your estate is large and will be divided among many beneficiaries. Of course, family or friends can also serve, but it’s important to consider the amount of work involved before placing this burden on your family or friends. Being an executor can be hard work and may have court-ordered deadlines, so it’s crucial to pick someone you know will be up for the job. They will probably need to hire a CPA to help sort out your taxes and a lawyer to assist in the process. Of course, if there’s a dispute, attorneys, appraisers, mediators, or other professionals will undoubtedly need to be involved. Choosing a spouse or someone else intimately involved in your life can be convenient because they may already be familiar with your assets and have an easier time making sure your wishes are carried out. However, because of the time involved and the nature of some assets, they may not be up to the task at the time. Let us help you make the process of picking your trustee, powers of attorney, and executor as smooth and headache-free as possible. Once you have these choices in place, you’ll be able to rest easy knowing that your estate plan is in good hands no matter what life brings. 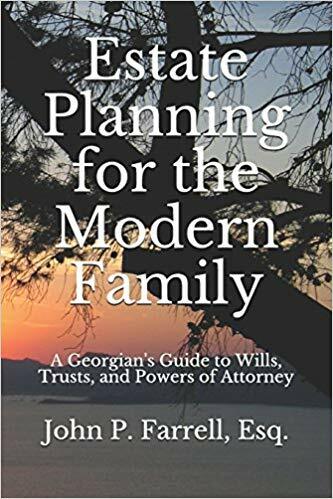 Give us a call at (678) 809-4922 to make an appointment today or pick up my book, Estate Planning for the Modern Family: A Georgian’s Guide to Wills, Trusts, and Powers of Attorney, for more information. Previous Previous post: How do I choose a Guardian for myself? Next Next post: What do I do when my kid goes to college?